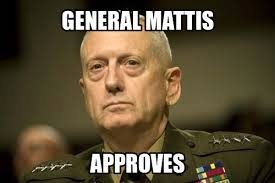 Newly minted Secretary of Defense James Mattis celebrated his first full day at the Pentagon by overseeing 31 strikes against the Islamic State in Iraq and Syria. Mattis entered the Pentagon Saturday with a smile for his first full day of work, and for good reason, considering the significant bombardment ISIS forces received. This entry was posted on Monday, January 23rd, 2017 at 6:00 am	and is filed under Military, Open thread. You can follow any responses to this entry through the RSS 2.0 feed. Both comments and pings are currently closed.